Wendy from CaribousMom is hosting a fun challenge. This one is designed to help you get through your TBR. The idea is randomness. The challenge for me will be to pick a book at random instead by mood or review schedule. 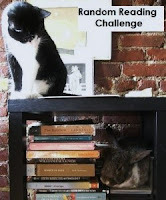 I'm committing to 12 books for the challenge (there are different levels), which means one a month from August 1, 2009 to July 31, 2010. I can do it -- I think! 2. Count the books, numbering them from the top down. 3. Head off to random.org or another random-number generator and pick a number. 4. Read the book that was selected. 5. Repeat the procedure each month. I think this is going to be a fun way to get through my books. And Wendy mentioned that there would be at least one prize (in case you need incentive!). Really, how hard can it be to complete this challenge? this does sound like a good challenge to do. I am need of some randomness. You are something, you know that? How can I resist such a thing? It is the perfect way to force yourself through the TBR that breeds at night. It's just one a month, which should be doable, even with all of the other things going on. OK, I'm headed over to sign up. This challenge sounds like a good idea... Might have to sign up! So glad to see you are signing up, Beth!!! I hope this is going to be really fun! You are taking on so many challenges. I don't know how you manage everything! I don't do challenges, but I like the idea of using the random number generator to help me pick my next book. Even with 95 books on my TBR list, there are days when nothing looks good! That was a new one! It doesn´t appeal to me, though. I think in time I am going to read each and every book on my TBR, but not in that way. It is important for me to pick exactly the book that appeals to me in that moment. Just popping by to say thanks for your comment on my guest post at Maw Books. Then again, I usually can't resist (hence why I'm doing so many challenges!!). I will pop by CaribousMom and take a look. I haven't really been in a book challenge yet (a rookie so to speak..lol), but this sounds like something I would totally enjoy. I have a few questions but I'm sure they will be answered. What an interesting challenge! I am very tempted, but also resolving to be very disciplined about adding on new challenges. I like this challenge ... I think I will do it too. The deadline is reasonable and I like to built "victory" into my challenges since I'm a huge failure at my 100 book one!